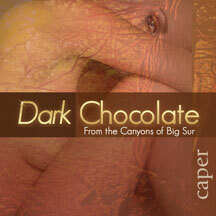 Spontaneous and improvised, Caper is the third album from Dark Chocolate, featuring Kim Stone and Clay Henry. This lineup of Dark Chocolate features Kim Stone (Spyro Gyra, The Rippingtons), Clay Henry (Barefoot), Joseph Lucido, Webber Iago, Mike Shannon, John Nava, Nico Georis, Jayson Fann, Rick Chelew and others in one of their more adventurous sets. These established side men and A-list session players are equally at home weaving familiar themes as they are stretching outside the pre-conceived boundaries of their a continuously-moving playground. The voices of Ashley Mazanec, Jacqui Hope, and Lori Hofer are featured.